Το πολυαναμενόμενο Rune (μέχρι πρότινος Rune: Ragnarok) είναι έτοιμο για (πρώιμη) κυκλοφορία. Όπως ανακοίνωσε η δημιουργός Human Head, το Rune βγαίνει 19 Σεπτεμβρίου στο Steam ως early access. Ως γνωστόν, το Rune είναι open-world RPG με Viking και πνευματικός διάδοχος του κλασικού Rune. Το παιχνίδι διαδραματίζεται στο Midgard κατά το Ragnarok, όπου θεοί, θηρία και οι τελευταίοι εναπομείναντες άνθρωποι προσπαθούν να επιβιώσουν. Πολεμάτε γίγαντες, δράκους, νεκροζώντανους κτλ, με στόχο να κατατροπώσετε τον μοχθηρό Loki και τους υποτακτικούς του και να δώσετε τέλος στο Ragnarok. Υπάρχει επίσης PvE αλλά και PvP multiplayer. Δείτε επίσημα χαρακτηριστικά και νέο trailer του Rune και πείτε μας αν σας ενδιαφέρει! • Explore Vast and Dangerous Lands: Once-beautiful Midgard lies in ruins, disfigured and drowned. Braving destruction and death, stalk your ravaged world in search of Loki’s minions…and the Trickster himself. Where Ragnarok has warped the land most, there you may find the most powerful weapons and resources..
• Go Alone or Team Up With Friends: Brave the end of days alone or invite fellow warriors to accompany you through Ragnarok. Together, sail a fleet of longships to overrun enemy fortresses, battle side by side against giants and enormous monsters, and stand as one to face Loki himself. Add to the madness of Ragnarok in brutal PvP battles to see who may be the most feared Viking in Midgard. • Choose Your God: Align with a Norse god to receive unique abilities and skills to aid you on your quests. Do you align with Thor, who grants you strength? Or with Hel, who gives you power over the dead? Or perhaps the Allfather himself, Odin, who will grant you additional protection from the dangerous world? Choose wisely. • The End of Days: Ragnarok has plagued the land of Midgard for far too long. Its end is coming but Loki’s twisted plan is to reset it back to the beginning of the end of days. You and your clan must do whatever it takes to destroy the Trickster god and save Midgard from a perpetual Ragnarok. • Collect Powerful Equipment and Harness Rune Powers: Complete quests for your god through mystical runes and harness their powers to improve your combat abilities. Pillage villages and take down powerful enemies to gain weapons and armor as you transform yourself into a warrior capable of taking down a god. • Prove Yourself: As the legends foretold, your dying realm is being torn further apart by war. 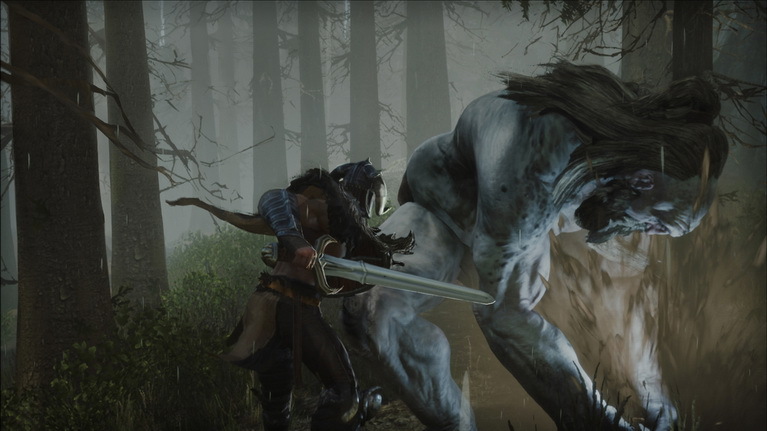 Huge monsters, giants, feral beasts, living warriors, and the dishonored dead alike, all tear at one another for dominance over what is left of Midgard. Warrior, can you rise above the fray? Can you prove yourself mightiest of all by slaying Loki?